ALR Earthmoving Repairs is owned & operated by Andrew & Lynn Robyn Frino. ALR has been operating since 1994 and has weathered all the ups and downs of the economic changes during the last 20 years. Andrew is the backbone of ALR . Andrew has spent over 30 years in the earthmoving repair business. His early years were spent in the employ of JI Case (Australia) on the workshop floor at Darra. Then in field service and finally as workshop supervisor. He left Case in early 1994 and started working for himself as a mobile earthmoving machinery repairer. ALR Earthmoving Repairs has been servicing and repairing many owner operator’s machines and other various company earthmoving machines ever since. 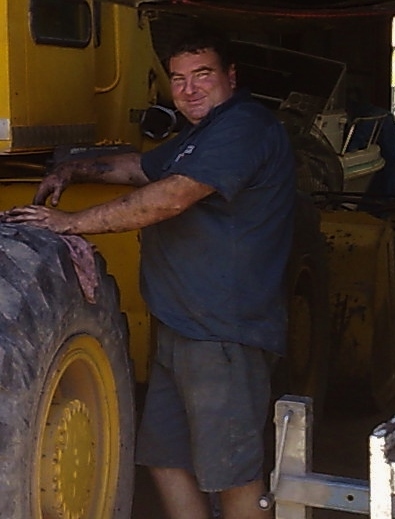 All these years of personal service to our customers, repairing machinery and keeping their machines going, has given Andrew vast experience in troubleshooting and diagnosing faults in hydraulics, transmissions, engines, electrics and most importantly he recognizes the needs of customers – whether they are fleet owners or owner operators. There is hardly a problem found on a Case machine that Andrew has not seen before. This experience has been a key factor of our business, allowing ALR Earthmoving Repairs to keep offering it’s services to customers till now. Our reputation in this field speaks for itself. Like any business, we can’t afford any lost profit so that means we want to avoid any failures on any repairs that we carry out – whether an oring is replaced at a fitting or a crown wheel and pinion on a 1450! We want to do it once and we want to do it right. If customers aren’t happy they won’t come back and they’ll tell their mates – we don’t want that. What does this mean for you? Basically, a better repair. At a time of grief, we will make you, a little bit happier by our providing an honest repair job, as quickly as possible, and hopefully, within your budget. Our reputation relies on our customers being totally satisfied. We welcome any enquiries concerning your problems on your Case equipment – we are ready to help. Hi there. I’m currently looking for a small dozer to purchase, up to about D4 size. I’ve been hoping to find some case machines to view. Seeing as I’ve just found your informative website, it can’t hurt to ask if you know the whereabouts of some machines for sale. I want a pat six way blade and rippers. I’m even looking at the Komatsu d21 size machines. I may consider a drott instead. Looking to purchase up to around 25k, could push to another 10 more for a good machine that is about 80hp. So if you know of any I’d appreciate that thanks. I’m located in the Coffs Harbour area. I don’t know of such a machine at the moment, however things change everyday. If I hear of something I’ll let you know. I have a 1991 590 turbo CK 4×4 that has had an intermittent shuttle engagement issue on startup for several years now. Once it engages it is fine. Removed the valve assembly cleaned and inspected check the solanoid even installed the service bulletin 62317 adding a detent ball in the valve body for flow controll. The issue almost seems at times electrical. I say this because it will engage even in cold temps after tuning the key off and then back on at times. Has full power once engaged. No other issues. Firstly, are you sure the electrical neutral valve solenoid is not activated, while the fault is present, due to a sticky cut-out button? Secondly, charge pump cavitation can cause this symptom. Is there any oil leaks present while the machine is parked? Tighten the hose clamps at the transmission suction line. Be certain that the steel pipe at the suction line has not worn through by wearing against the chassis or had a hole put in it by a battery cable short. First place to check is the relays in the fuse box. Listen if they are clicking while shifting the FNR lever. There is a bigger relay – neutral timer- be sure it has not come loose. If you were clearing brush, be certain the wiring harness entering the transmission control valve has not been damaged. I would not think the braking or ride control are related to this problem. I have a Massey Ferguson Drott MF400. Has 6 cylinder Perkins and Power shift transmission with the 3 speed forward and reverse. What is the procedure with checking the transmission fluid level. Cold/hot/engine idling or turned off etc. Im looking at selling this machine so if some one is interested in getting someone to look at this are you interested in doing this? We are 20 minutes west of caboolture north Brisbane. I can’t be certain regarding any info on your Dozer as I don’t have any hands on experience with those models. My travel time to & from your location might make an appraisal a little expensive. I guess it would depend on who is interested in buying it…. Hi, i’m Chris and i’m looking to order for a used machine for the farm. Is there any way to get this through? Not sure if you realize this website is based in Australia, as is also the machine you are enquiring about. Do you still wish to contact Simon Neil? If so I could forward his email address.